It appears, the heavens closed up the watering hole without announcing “last call” to all the thirsty California patrons. Angelenos have been asked to cut back another 20 percent on water usage…take that roses, hydrangeas and grass. We’re cutting you off! Xeriscaping (as close to zero watering as you can get) is the new native gardening. Enthusiasts and their projects are popping up all over, sometimes blowing the mind and pocketbook. But if you want to keep it simple and local, here’s a new option inspired by California’s mountainous terrain: dry stream beds. ENRICH LA co-founder Tomas O’Grady at El Sereno Middle School. A water-wise stream bed looks fantastic whether it’s raining A) cats and dogs, B) men, or C) none of the above, which is currently where we stand in this long-suffering relationship with water. An arid beauty during the dry season, it becomes a tranquil waterway that babbles over plants, rocks and soil when it rains…and it will rain…someday. El Sereno Middle School principal Dr. Frances Gipson was unaware her campus held a great setting for a dry stream bed when she placed a call to get a school garden. Enrich LA, (enrichla.org) a non-profit whose mission is “a garden in every school,” has built more than 60 gardens in Los Angeles United School District school in three years. 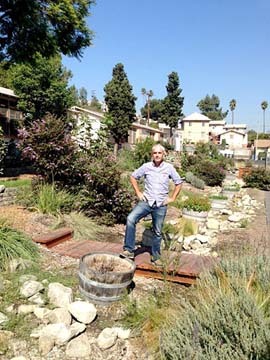 Tomas O’Grady, who co-founded the organization in 2011 with his friend Leonardo Chalupowicz, saw beyond the half acre of asphalt eyesore at El Sereno and designed a xeriscaped garden complete with vegetables, bridges and a stream bed for the campus and community. Together, Enrich LA volunteers worked with students, staff and parents to transform the blighted area into a respite where the noise of the playground is buffered by green foliage, picnic benches and hundreds of butterflies. The stream bed collects water from about 2,000 square feet. Runoff water percolates into the water table and feeds plants, fruit trees and vegetables. If there’s heavy rain, excess water, which has now been cleaned by the boulder-filled bed, will filter into an overflow drain where it empties into the Pacific Ocean. A dry stream looks great in any area with elevation, including front and back yards. It can also help solve drainage problems by directing water flow. Landscape designer Eva Knoppel, of Garden of Eva, agrees that a stream bed is good for the environment and for the soul. “Most people don’t think to ask for a dry stream bed when switching to drought tolerant landscaping even though it could save water and eliminate grass. People love nature and are drawn to streams because they’re soothing. So incorporating something that acts like water, even though it’s a dry stream, is good for the psyche,” said Knoppel. Maybe that’s why the El Sereno students and butterflies are relaxing on the hillside, enjoying their new retreat. It’s like going to the mountains… if only until the next bell rings. By California Greenin’ columnist Renee Ridgeley.